Today I am sharing some information about my Online Rewards. You may have seen the link at the bottom of each of my posts regarding this. So I thought I would make a full blog post explaining how it works. 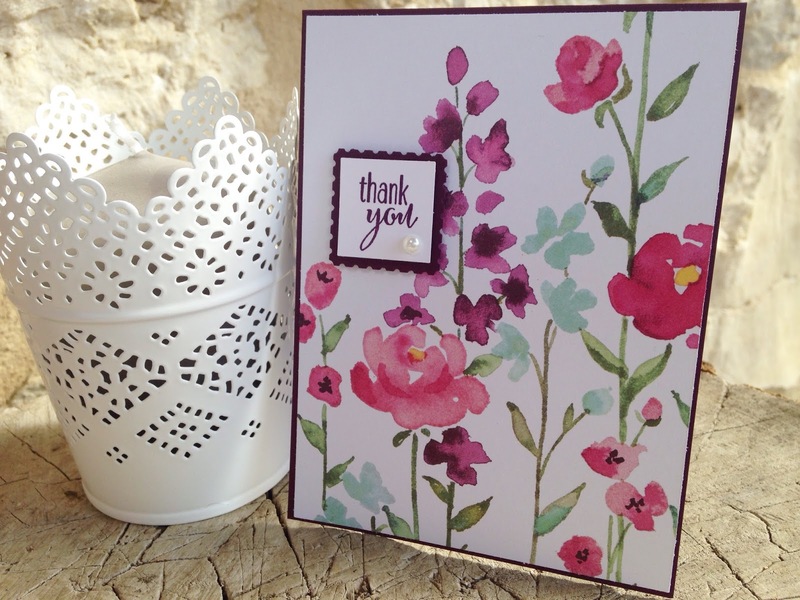 I am so grateful to all my customers and this is an extra way of rewarding you with some Stampin' Up! goodies! When you enter the code your order is automatically grouped with other orders that also entered the current code. I then allocate these rewards with everyone who joined in and shopped with me during the month. Using the rewards I purchase items as gifts for my customers. Because I can see the specifics of your order and your history of shopping with me I can ensure that I do not duplicate a product when purchasing your gift items. All gifts are dispatched separately from your main order, they are sent directly from me and are a thank you for your order, I really appreciate that you choose to shop with me. In addition if you spend 150€/£120 before shipping, you will qualify for a free *make and take kit*. This again, will be sent separately from your main order, it is shipped directly from me. WHAT ELSE MUST AN ONLINE CUSTOMER DO? 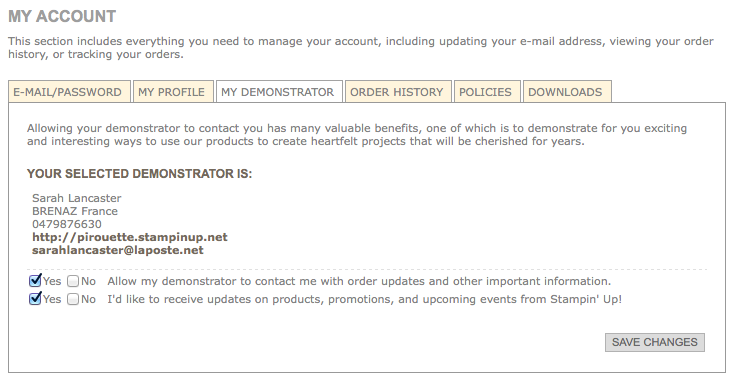 There is one more step that you need to take to ensure that you can receive a gift from me. By Data Protection Laws I cannot contact you unless you give me permission to do so. So even if you correctly enter the Hostess Code I cannot send you a gift unless you allow me to contact you as your Demonstrator. Again it will show my details and below that are two boxes. The first box needs to be set to Yes for me to be able to send you a gift. Each month I receive online orders from customers who are *no contact/pas de contact* and I feel sad because I cannot give you an extra reward for choosing to shop with me. Please be advised that I will never use your details for anything other than an address label for your gift and thank you card. I have a separate Newsletter and the sign up box is on the right hand side of my blog and I will never give your details to Third Parties! WHAT GIFTS MIGHT I RECEIVE? Where do I enter this month's code? Navigate to the ‘Shopping Bag’ screen and enter the current code in the box in the lower left had corner and click ‘apply’. It asks *Do you have a hostess code?*. My name ‘Sarah Lancaster’ will appear. And that is it! Continue shopping or proceed to the checkout. If you receive an error message regarding the code, double check the one at the top of this page as I always update this page as soon as a new code is created. What if my order is 200€/£150 or more, should I still enter the code? I really hope this is helpful but if you have any questions or need anything further clarified you can contact me here. Remember it is also a great time to join Stampin' Up! as a demonstrator and you can read all about it here. You can join today online and I would be delighted to welcome you to my team of Pirouettes.